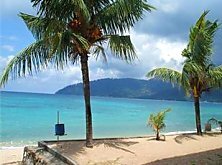 Babura Seaview Resort in the village of Tekek, in Tioman Island, is a great option for when price is your primary concern. Backpackers like Babura because they offer a complete package at a very low price. Scuba-divers tend to gravitate at Babura too, because it's very close to several dive schools. Click here if you want to book a Babura Seaview Resort cabin. If you prefer to have your food and drink establishment near to your room, then Babura won't disappoint, because it offers a great eatery right next to its rooms. Lunch and dinner meals are surprisingly scrumptious, breakfast, being bread or simple noodles, is by far the most basic of the meals. Still, breakie is included in the room rate, so you can't really knock it. Besides, there are other "makan" places withing walking distance. FYI, Babura's restaurant is halal. Some rooms have fans and only cold water, whilst others offer hot water, as well as air-con and fan. The fan-only rooms are obviously cheaper, so go for one of these is you prefer low-budget. Babura has great wi-fi, to the extent that if your room is near the reception area, you can even use wi-fi whilst in your room. Mind you, the for the fastest speeds, you need to be in the reception. Not too bad an option, because there are a few comfy couches available. Click here if you want to book a Babura room near the reception. By the way, Babura's staff speak more than adequate English, so full marks to them on this count. The Babura grounds also comprises a quaint Tioman souvenir shop and a bicycle rental counter. There's a supermarket just a short walk away too. Incidentally, Babura is about 10 minutes away from Tekek's main area, the ferry terminal. There are quite a few places to eat here and plenty of provisions shops too. Its also the place to go if you're looking to go fishing, island-hopping, kayaking, stand up paddling, etc. Ask for "OP". Need to book a Babura Sea view room? Take your pick here. Book now, pay later. 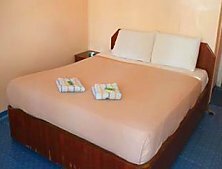 Babura Seaview Resort's rooms are well-maintained and clean. The latches on doors and windows are a bit long in the tooth, but after staying here many times, I can safely say that petty crime, such as room theft, in this neck of the woods in non-existent. Babura Seaview Resort is cheap but good. If all you need is a decent roof over your head whilst spending your time scuba-diving and/or exploring Tioman then Babura Seaview Resort is ideal. Helpful staff, solid wi-fi, F&B next-door, awesome location, optional air-con and hot water. All the boxes are ticked. Budget traveler? Then Babura Seaview Resort is recommended. Tip: Babura Seaview Resort is full most of the weekends so better book early Also, for those interested, the beach view chalet is like having your own private beach and worth the slightly higher rate. Use Agoda's remarks/requests section to let Babura know your preferences.